The “Forever” bell donated by Joan Kibbe as part of the Crouse Chimes Project. Joan Kibbe was a graduate music student at Syracuse University in the early 1960s when she discovered the music of Gustav Mahler. While taking classes in what is now the Rose, Jules R. and Stanford S. Setnor School of Music in the College of Visual and Performing Arts, she studied the Austrian composer’s “Das Lied von der Erde” (“The Song of the Earth”), a symphonic song cycle that reflects the uncertainties, sorrows and fleeting pleasures experienced by mortals in life’s journey. Kibbe found the concluding text of the sixth and final song, “Der Abschied” (“The Farewell”), to be especially moving. Everywhere the lovely earth once again greens and blossoms into spring. “The German word for ‘forever’ is ‘ewig,’ and it is repeated seven times until the music dies away to silence,” notes Kibbe. Fast forward to 2016, when Kibbe, who earned both her undergraduate and graduate degrees in music at Setnor, was making a gift to the University in honor of her music classmate and longtime friend, Ellie Daubenthaler Felice ’60. While visiting VPA’s website, Kibbe noticed the opportunity to contribute to the Crouse College Chimes Project, which included the installation of four new bronze-cast bells, among other improvements. She decided to underwrite the cost of one of the new bells. Though she never rang the chimes (“Climbing ladders has never been my forte!”), Kibbe has special memories of the chimes, including one from her senior year, when she was member of the SU Symphony Orchestra under the direction of Professor Louis Krasner. As part of the 1959 Commencement festivities, the orchestra gave a performance on the evening of May 30 in Archbold Gymnasium. “It met my desire to find a single word which in itself was neutral, yet inclusive,” explains Kibbe. The word “forever” also brought back another special moment to Kibbe from her 1959 Commencement in Archbold Stadium. 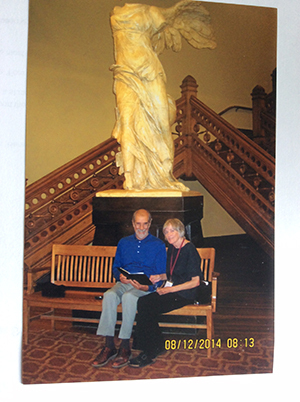 Joan Kibbe and her husband, Richard Scaramelli, sit in front of “Winged Victory” in Crouse College in 2014. After earning her graduate music degree in 1963, Kibbe taught in Syracuse public schools for seven years, later completed a teaching certificate program from the Kodály Music Training Institute at the University of Hartford in Connecticut and spent the majority of her career teaching in public and private schools, kindergarten through college levels, in and around Keene, New Hampshire. Now retired, she and her husband, Richard Scaramelli, enjoy attending to gardens on their 19th-century homestead and contributing to civic life in their New Hampshire town. She continues to be a “forever” fan of her Syracuse education. 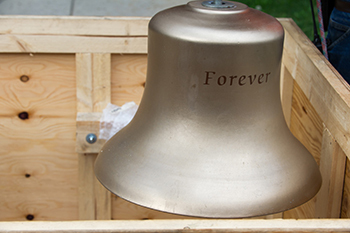 Note: The four new bells, including Kibbe’s “Forever” bell, were installed in Crouse College’s bell tower in August. If you, or someone you know, would like to make a lasting impact on this Syracuse University landmark, you can make a contribution to the project. We encourage alumni to donate, knowing that your gift will “ring true” for generations to come! To learn more about the Crouse College Chimes Project, please visit VPA’s giving opportunities webpage.